KEM (Kyoto Electronics) has endeavored as a specialized manufacturer of scientific instruments since 1961 introducing a broad product line of analyzers of high quality and reliability including Analytical and Measuring Instruments that addressed laboratory needs of the time and Continuous Monitoring System that has met ever demanding environmental protection. Viscous liquid up to ca 2000 mPa?s can be sampled in. Applications: Beverages, foods, petroleum, chemical products, pharmaceutical, alcoholic beverages, etc. Display content Density, temperature compensated density, specific gravity, temperature compensated specific gravity, Brix %, alcohol concentration, sulfuric acid concentration, API degree, Baume degree, Plato and Proof degree, etc. 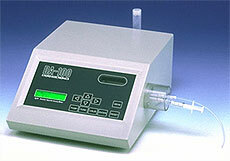 Temperature compensation 10 kinds of coefficients per sample plus temperature to be corrected can be entered. 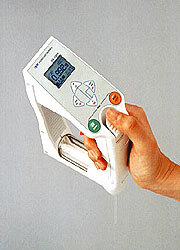 Auto calibration Can store density of water at various degrees of temperature required for calibration of the measuring cell. Sampling By syringe type hand pump. The built-in thermostatic control makes measurement stable in resulting values. Thus, human error is eliminated in addition to easy operation and high precision. Applications: Beverages, foods, petroleum, pharmaceutical, alcoholic beverages, etc.